Pharrell Williams attends the Chanel Cruise 2018/19 Replica Show on October 31, 2018 in Bangkok, Thailand. When we heard that musician, producer and quirky style icon Pharrell Williams was trademarking the name “Girl” for future fashion ventures, we were understandably curious. While not his first foray into fashion (see: his highly popular and ongoing Adidas collaboration and the long-running Billionaire Boys Club and Ice Cream lines), Pharrell’s personal style had us wondering what he might have in store for the ladies. But we’re hearing that the multihyphenate’s next move will come with a major assist from iconic fashion house Chanel. As reported by Elle, hot on the heels of the label’s Cruise 2018-19 Replica Show on October 31 in Bangkok, Thailand—where Pharrell performed a private concert—it’s been announced that he’ll be debuting a ready-to-wear capsule collection with the famed French fashion house in March 2019 in Seoul, Korea, followed by a worldwide release on April 4. 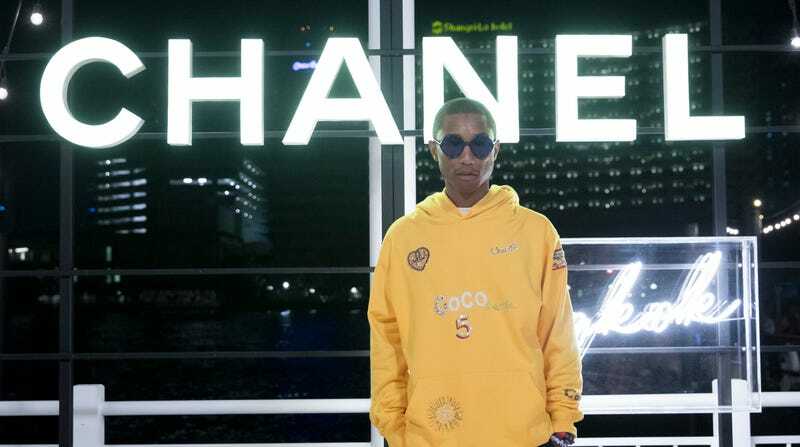 While no visuals of the collection are available yet, Pharrell apparently teased a few items while in Thailand, posing in a yellow hoodie with sequined logo appliqués and “Coco Pharrell” across the chest. Posing in another photo with his wife, Helen Lasichanh, and son Rocket, Pharrell wore a black-on-black zip-up that may also be part of the upcoming collection, with the classic “Chanel” embossed into the fabric across the upper half. (No word on whether Helen’s trench is also a tease of the collection). Pharrell Williams, left, Rocket Williams and Helen Williams attend the Chanel Cruise 2018/19 Replica Show on October 31, 2018 in Bangkok, Thailand. Can we afford it? Probably not, but if you’re a die-hard Pharrell fan, start saving your pennies for spring, because this N.E.R.D.-level luxury definitely won’t come cheap.